Amid uncertainty on Israel-Jordan border, one thing will be certain if and when the king falls: Jordan’s next ruler will be a Palestinian. Israel has enjoyed calm borders with Jordan for over four decades. While Israel’s military superiority and alert borders guards are the main reasons for that, still, the Hashemite regime in Amman has managed to keep anti-Israel forces at bay, an advantage for which Israel has given much in return to Jordan’s king and his late father. But will this arrangement remain the same with the tsunami of the Arab Spring? The facts on the ground suggest Jordan is anything but stable. Upon the king’s return from his recent visit to the US, tribal fights broke out in Ma’an, Jordan’s largest governorate in the area. Four people were killed in cold blood on the campus of Ma’an’s university and all hell broke loose. Now Ma’an residents are claiming “independence from the Hashemite regime”; videos leaked on YouTube and even appearing in Jordanian media show raging gun battles between Jordan’s army and tribal Jordanians in the south. The last police post was declared “liberated” by Ma’an’s locals on June 24. Despite public calls “daring” the king to visit Ma’an to solve the matter, Abdullah visited Kerak, another troubled southern city in Jordan, 160 km. from Ma’an, two weeks ago. Abdullah spoke in Kerak’s university, Mutah, where regular gun battles between students recently claimed the life of a sophomore. In his speech, Abdullah said there were “those who try to claim that Jordan is going through unrest because of the tribes. That is not true! The tribes have always been a foundation of security.” Four days after his speech, gun battles broke out again on the very same campus. At the same time protests right at the gates of his private palace became regular events, with people calling for him to step down. The king’s troubles did not stop there. On June 22, Gazan Palestinian Muhammad Assaf won the Arab Idol reality television competition. Jordan’s Palestinian majority took to the streets for days in massive numbers, waving Palestinian flags and kaffiyehs right under the noses of Jordanian police. In the past, merely wearing a Palestinian kaffiyeh in Jordan could get you harassed by the police, and hanging a Palestinian flag on your car would get you imprisoned by the fearsome intelligence department. Young Palestinian men were moreover seen all over Amman shooting their M-16 rifles in celebration. While it is common knowledge that Palestinians in Jordan have weapons just like their brothers on the other side of the river, they never showed them off before, nor were they ever able to show off their oppressed character right in the Hashemite regime’s face. In short: the king’s formerly loyal “East Bankers” now want him out, and the Hashemite-despising Palestinians are not afraid to move against the king openly. This means the king’s days might, indeed, be numbered. Speaking to a crowd in London almost a year ago, Arabist and political thinker Murdachi Kedar said: “Those buying an insurance policy on the Jordanian regime’s survival should reconsider their options.” Even more, he predicted Jordan’s south would break away from the state. Apparently, Kedar’s prophecy for Jordan seems to be fulfilling itself. But what would that mean for Israel’s longest borders? If Jordan falls into Islamists’ hands it will turn into either another Hamas or at best another Egypt. Nonetheless, the Islamists in Jordan have had a long partnership with the Hashemite regime, and the Jordanian Muslim Brotherhood has been openly refusing public calls to topple the king. Additionally, The Independent, the Associated Press and Al Jazeera all reported Jordan’s secular citizens were the ones leading the protests against the king; nonetheless, they are not financed as are the Islamists, and they are almost totally ignored by the Western media. If the king falls, the Islamists opposing the revolution now will hijack it and put a president in Amman. Unless something changes and secular population gets the support it needs. The response among those concerned about peace in the Middle East does not seem to match the level of the threat an Islamist takeover of Jordan poses. They are basically ignoring the facts. In an interview with The Atlantic’s Jeffery Goldberg, Abdullah admitted he thought of stepping down back in 2010, before there was an Arab Spring. What would the king do if Jordanians do actually take to the street like the Egyptians and Tunisians did? There is another camp, nonetheless, one that agrees that there is not much to be done to save the king, and that instead he should be replaced by a pro-peace secular Palestinian leader. Wondering if that were even possible, I spoke to Palestinian-Jordanian writer and former Washington Institute fellow Samer Libdeh, who lives in Amman. Amid uncertainty on Israel’s eastern front, one thing will be certain if and when the king falls: Jordan’s next ruler will be a Palestinian. Those who care for peace and Israel’s eastern borders should try to prepare for the coming storm and ride the freedom train to help put the right engineer in the front carriage. Now even the Palestinians are fighting back against the decision by the European Union to boycott any Israeli businesses with a presence in the so-called "occupied territories." A senior Palestinian Authority official who spoke on condition of anonymity told Israeli media that the European decision was not all that popular in Ramallah, despite ostensibly being made in service to the Palestinian nationalist cause. "We have a number of officials at the European Union who are trying to reverse the decision," the unnamed source said. The new directive, which forbids nations in the euro zone from doing business with "Jewish settlers," will not only weaken those Israeli companies, but will have a major negative impact on the Palestinian economy, as many thousands of Palestinian Arabs work for those very same companies. Expressing the concerns of many, Sammer Darawsha, a Palestinian employee of at a Jewish-owned greenhouse near the settlement of Halamish, said, "The decision affects everyone, whether Jew or Arab. If they (the EU) take away our livelihood, what kind of peace will then prevail here?" The Palestinians clearly realise that the 10’s of thousands of jobs are in jeopardy because of the EU action, jobs both in Israel within the armistice line and in Judea and Samaria, see http://www.youtube.com/watch?v=Mo1pUjQHj_I. "My father kicked me out when he discovered I enlisted," said Ibrahim. But this Bedouin soldier’s dedication to the IDF eventually changed his father’s mind. When Ibrahim graduated high school with honors, his father urged him to forgo on the army draft and direct his potential towards academic studies. When he enlisted regardless, his father banished him from the house. Now, upon completion of his officer’s course, Ibrahim describes the pride he holds for his country, the obligation he felt to enlist in the IDF, and the friends he met on his way to completing his dream of serving in the IDF. In Ibrahim's home village of Bu'eine Nujeidat in northern Israel, military enlistment is routine. Most of the youth are recruited for full army service at age 18, with IDF officers often coming to speak with high school students in the village about contributing to the army in a significant way. Military uniforms hanging to dry on clothes lines outside apartment patios is not an unusual sight for the village’s residents. Israeli law, however, does not require them to enlist. Ibrahim was impacted by the presence of IDF soldiers coming to his school every year, and their discussions about the purpose of the army and the importance of enlisting. So, he decided to join. “When I graduated from high school in 2006, I was all set to join the army,” Ibrahim said, indicating that his recruitment date was set for the summer of 2006 - the same summer during which northern Israel was under heavy rocket attack. Those attacks eventually lead to the Second Lebanon War. Although Ibrahim had no choice but to continue living a life without a military uniform, he never let go of the idea of ​​recruitment. "I began to study civil engineering at the Technion university in Haifa. After two years, some of my friends who enlisted in the army were released, and that is when it hit me,” he recalled. "I started to think again about enlisting. I decided that I’m not waiting anymore and I immediately went to the recruiting office. I completed the necessary tests and medical exams, and I enlisted without anyone knowing," he said. Ibrahim finally enlisted into the IDF on March 27th, 2011. He was drafted into the Bedouin Desert Reconnaissance Battalion. While he enlisted secretly, Israel is too small a country, and secrets are easily revealed. Shortly after his draft, news of Ibrahim's enlistment reached his family. Ibrahim painfully recalls his father’s reaction: "My dad called me and said, 'Do not come home. I do not want you at home.’” The following weeks, he divided his time between the base and in the field, with weekends spent at his aunt’s house. Following weeks of no contact with his family, Ibrahim returned to the place where he grew up and sat down with his father. Ibrahim discussed the long and difficult conversation he had with his father: "He asked, 'Why did you do that to me? What was missing in your life? Why did you leave school six months before graduating?'" Ibrahim recalled. “I told him I was an adult and that I stand by my decision. I am an independent person and I want to determine my own future. Eventually, he accepted it." Eight months later, Ibrahim successfully completed his officer’s course. Ibrahim's family attended the graduation ceremony, which was held last month. “The purpose of these guidelines is to make a distinction between the State of Israel and the occupied territories when it comes to EU support”. If using the words “illegal occupation” is acceptable to the EU for its action against Israel, then why has it never taken action against Turkey’s occupation of Northern Cyprus? b) it suggests that Israel should abandon the Golan Heights, thereby plunging the people living there (mainly Druze) into a vicious 2-year-old civil war that has killed over 100,000. In other words, the EU has decided on the outcome of any future “negotiations”, should they take place and provided the Palestinians with a perfect case for not entering into negotiations as long as the EU is applying their “unilateral decisions”. The EU is reinforcing the Judenrein policies of the Palestinians. Whatever borders are drawn up after a peace settlement, why is the assumption made that Jews may not live anywhere they choose? NGO Monitor's president, Prof. Gerald Steinberg, pointed out, "The new EU guidelines are evidence of the influence of political NGOs - some funded by the EU - on the EU's policies. On occasion we have seen the EU rely solely on political NGOs' reports without checking their veracity. The practical results," Prof. Steinberg continued, "are worrisome and reflect a faulty and one-sided agenda." The NGO Monitor report issued last year, EU Documents Repeat False NGO Claims, showed the direct connections between the NGOs secretly funded by the EU and EU policy recommendations based on their distorted and one-sided reports. Many of the falsehoods focused on Jerusalem and "Area C" in the West Bank, precisely the issues dealt with in the EU's new guidelines. What is Defined as Illegal? It would appear that the EU totally discounts existing international legal agreements and prefers to interpret clauses in these agreements to suit its own agenda. of the Jordan River. It is still valid today. b) Article 6 of the Palestine Mandate signed by the League of Nations in 1922 stipulated ‘close Jewish settlement’ on the land west of the Jordan River. The river served as the boundary because that year the UK created a new Arab country, today known as Jordan, by unilaterally bestowing the land east of the river onto the Hashemite dynasty and thus giving some three quarters of Palestine away. c) The 1945 UN Charter, Chapter XII, Article 80 explicitly says than nothing within it shall ‘alter in any manner the rights whatsoever of any states or any peoples or the terms of existing international instruments to which Members of the United Nations may respectively be parties’. e) The Geneva Convention applies to actions carried out on the territory of a ‘High Contracting Party’ with a sovereign claim to that territory. But the areas in question over the ‘Green Line’ never belonged to any sovereign power. I hope these points can be distributed widely, the world is totally ignorant of what is international law and what is myth to suit an agenda. Guess Who Got First Place in the Technion Med School? Guess who graduated first in this year's medical school class at the Technion, Israel's version of M.I.T.? The answer will surprise you. It's a 27-year-old stereotype-buster: a charming, feminist, smart, open-minded and observant Islamic woman named Mais Ali-Saleh who grew up in a small village outside of Nazareth, in Israel's Galilee. Ali-Selah's academic excellence not only marks her own personal achievement but also proves that contrary to propaganda spouted by proponents of the BDS (Boycott, Divestment and Sanctions) Movement -- whose latest convert is Stephen Hawking -- an academic boycott of Israel is the wrong approach to solving the Israel-Arab conflict. Moreover, it ultimately hurts the very people it claims to help. Ali-Selah put it best when she said, "An academic boycott of Israel is a passive move, and it doesn't achieve any of its purported objectives." After Ali-Selah's first class at the Technion, in Haifa, northern Israel, she was ready to call it quits. Ali-Selah had studied Hebrew from elementary school through high school but in the predominantly Arab area around Nazareth, she rarely used Hebrew and her vocabulary was limited. During Ali-Selah's first Chemistry lecture, she couldn't understand why her professor kept talking about malls. What did shopping malls have to do with Chemistry? She then realized the professor was speaking about moles, a standard scientific unit for measuring quantities of minute entities. The Israel Gaza Coordination and Liaison Headquarters (GCLH) had held a seminar for Gaza farmers on agricultural cultivations, designed to further facilitate the Gaza agricultural sector. During the course of the seminar, attendants had concluded various tours and learning sessions on a variety of topics. The farmers` attendance at the seminar was achieved via the GCLH Agricultural Liaison. Last Wednesday and Thursday two groups of Palestinian farmers (60 persons in total) had left the Gaza Strip in order to attend an agricultural seminar in northern Israel, designed to further facilitate the Gaza agricultural sector. Farmers, heads of agricultural associations and merchants had arrived at the conference sponsored by Origins Seeds Company, a company which exports cucurbitacae (pumpkins, squashes, etc.) and field cultivation seeds to 17 world countries, including the Gaza Strip and the West Bank. Last years, the farmers had purchased seeds from the company and were pleased with their quality, and so it was important for them to attend the seminar and learn more about the product they're using. During the seminar, the farmers completed several workshops on cultivation methods, planting schedules, soil preparation, proper use of irrigation and fertilizer and disinfestations methods. In addition, the farmers focused primarily on watermelons, and had stated that this year, owing to the training programs conducted frequently in Israel; growers had achieved unprecedented crop yields – 11 tons of produce for each decare of cultivated fields – A twofold increase compared with the preceding year. Seminars such as this take place once a year. Nevertheless, Gaza farmers, with the help and guidance of the GCLH, attend seminars and vocational training sessions such as this on a monthly basis. The seminar allows farmers to obtain information directly from Israeli companies with which they conduct business, as well as from companies from around the world, thus further supporting and improving the Gaza agricultural sector. The Soldier's Fantasy Comes True!! What could motivate a soldier more than anything? Having a beautiful girl telling him what to do? 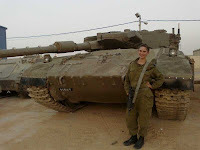 Esther Petrack was on the way to being the next big thing, after competing in the reality show “America’s Next Top Model” and making seventh place, when she decided a change of pace was in order.For her, the next big thing was entirely different; she wanted to become an IDF combat soldier. Esther was born in Jerusalem to a religious family and at sixteen, moved with her family to the United States. She made history when she became the first religious Jewish girl to compete in the “America’s Next Top Model”. She was on the fast lane to becoming a supermodel when things changed last year, during a visit to Israel for the first time in four years. Following her trip Esther decided to make Aliyah and join the army. Upon enlisting, Esther was asked where she would like to serve. Though offered the chance to serve in administrative positions and office environments, she insisted upon the combat position of tank instructor. Let’s Get the Facts Right on Refugees. Many people blindly following a predetermined agenda argue “that there is no evidence of widespread calls from neighbouring Arab states for the people to flee – if anything, there were calls to stay”. By quoting directly from Arab and objective sources at the time before revisionists attempted to change history. The calls to stay were – by the Jews!!! "The Arabs of Haifa fled in spite of the fact that the Jewish authorities guaranteed their safety and rights as citizens of Israel." Monsignor George Hakim, Greek Catholic Bishop of Galilee, according to Rev. Karl Baehr, Executive Secretary of the American Christian Palestine Committee, New York Herald Tribune, June 30, 1949; and, yes, no less than the Times of London , reporting events of 22.4.48 "...the Jewish hagana asked (using loudspeakers) Arabs to remain at their homes but the most of the Arab population followed their leaders who asked them to leave the country." So the evidence is, that the Jews asked the Arabs to stay and the Arabs forced other Arabs to leave. This is the evidence not of historians but of Arabs themselves and journalists on the spot is that there was no ethnic cleansing and no wanton destruction but simply abandonment of property, no different from any other war. Actually, one has to admit that there was some wanton destruction of property and some ethnic cleansing. The illegal Jordanian occupiers of Jerusalem destroyed 57 of the 58 synagogues in Jerusalem`s Old City and expelled its 20,000 plus inhabitants. 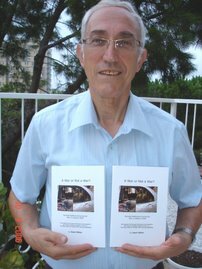 There is a bona fide dispute about the number of Arabs who left Israel in 1948. The UN figure based on Arab census figures is about 539,000. Many who left were part of the huge illegal immigrants doing as immigrants do today: leaving poverty struck Arab countries and following the prosperity. It seems that by the 1930s the standard of living of Palestinian Arabs was approximately twice that of Arabs in surrounding countries, whereas in Ottoman Turkish times it was lower than in surrounding countries. The number of 750,000 Arab refugees is often referred to yet there were only about 696,000 Arabs within the Armistice lines prior to the commencement of fighting! The UN figure is thus definitely on the high side but is still less than the 850,000 Jews expelled by Arab countries whose confiscated properties in today’s currency amount to $100 billion dollars. There was a population exchange similar to the 1948 Indian – Pakistan population exchange. The battalion developed techniques for fighting Hezbollah, based on years of experience operating in Israel’s northern border region; the new methods were tested in a battalion-wide exercise last week. The IDF’s Herev Battalion, made up of members of Israel’s Druze community, has gained many years of experience performing unique missions near the Israel-Lebanon border. In the 2006 Second Lebanon War, for instance, Herev was the first force to cross the border and the last to return – exhausted from completing a range of complex missions that earned the unit a citation. The Herev Battalion, referred to as the IDF’s “spearhead on the Lebanon border”, used its wealth of operational experience in the region to develop new combat techniques for fighting against Hezbollah. These new techniques were tested last week for the first time in an intensive battalion-wide exercise. “Combat in Lebanon demands the use of heavy armor and the slow advancement of troops,” explained the commander of the Herev Battalion. He went on to explain that fighting Hezbollah requires a specific method of combat, which includes the intensive use of firepower. “In order to fight against the enemy in Lebanon in the most correct manner, we took the techniques that exist today in the IDF for fighting in open areas, and we made the necessary adjustments. With the help of the battalion’s experience, and combined with an understanding of what to expect next time, we managed to develop a better and more efficient method,” he said. As part of the conclusions drawn from the exercise, a special document was drafted to present the techniques, which will be sent to officers throughout the IDF in order to assist in building a new combat doctrine for fighting against terror organizations. “The Herev Battalion must teach the entire IDF how to fight effectively against Hezbollah,” said the, commander of the regional brigade to which the Herev Battalion is subordinate. “There are additional adjustments to be made, but the technique proved itself during the exercise. We can already see how the fighters are now speaking a new language and that there is confidence in the methods that we tested,” . The new combat techniques were put to the test in the Herev Battalion’s most recent exercise, which took place last week and consisted of three days of non-stop fighting in the Upper Galilee and Golan Heights. The exercise simulated the battalion’s role during combat while functioning as part of a full brigade, in order to train the commanders to cooperate with other forces. The exercise simulated as closely as possible full-fledged combat in Lebanon, requiring the troops to deal with enemy rocket fire falling on their staging areas, sudden changes in mission plans and evacuating casualties in armored personnel carriers (APCs). A senior officer in the sector explained last week that Hezbollah’s actions in southern Lebanon are becoming more and more aggressive. Israeli forces stationed on the border observe well how Hezbollah agents work around the clock in the villages of southern Lebanon to gather intelligence on the IDF. The Herev Battalion, whose soldiers’ families live in northern Israel and are likely to be the first to suffer from a Hezbollah attack, continues to prepare for the “day after” on the sensitive Lebanese border.